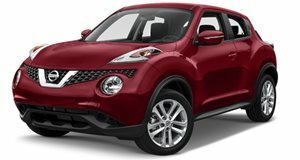 The Juke compact crossover is available with a 188 hp 1.6-liter turbocharged engine and a CVT continuously variable transmission that transmits the power to either the front or all four wheels. Consumption and performance levels are good for the class although the ride quality can be firm on rough roads. Funky styling does compromise interior space but pricing levels are good and the mid-range SV trim offers good value adding climate control a power sunroof and Nissan’s I-CON driver mode selection system over the base model. In years to come, the Nissan Juke will almost certainly be looked upon as one of the more pivotal cars of the early 21st Century. After all, this distinctively-styled little urban runabout with a raised ride height helped popularise the incredibly competitive compact crossover segment – a market any mainstream car maker would be a fool not to have a foothold in by now. But that reflective reminiscing won’t occur for a fair while yet, so it’s not a main concern to us for the moment. What is, though, is whether or not the Nissan Juke can still cut it in a class with plenty of alternatives to choose from. In a testament to just how right Nissan got that formula in 2011, though, the Juke still manages to be a pretty good compact crossover – albeit one that is now starting to show its age. The Nissan does fare better when it comes to trunk space, but not by a massive margin. One of the defining aspects of the Nissan Juke is the way it looks. Love it or loathe it, there’s no denying that those bulging fenders and split front headlamp arrangement give this car a presence that can’t be mistaken for any car on sale today - and it seems lots of people do like the styling, as nearly 200,000 have been sold in the United States as of April 2016. We’ll let you make your own mind up about the design of the Nissan Juke, but even its most ardent of supporters do have to concede the fact that those unique proportions have had an impact on the car’s overall interior space. Though the room up front and the plentiful array of sizeable storage cubbies are welcome, they don’t entirely overlook how cramped it is in the rear seats. Not only are overall levels of head and leg room quite restrictive (taller passengers in particular will find it especially difficult to get comfy in the back of a Juke), but the fairly small side windows make an already tight rear row of seats feel even more confined. The Nissan does fare better when it comes to trunk space, but not by a massive margin. At 10.5 cubic feet, it’s not too small for a car with these dimensions, but is a far cry from the . In the Juke’s defence, though, the space is more usable than you’d probably expect, thanks to the broad opening and a load lip that’s almost perfectly flush with the trunk floor. Most of the materials you’ll find are of a good quality for a car of this price. Better still, the Nissan Juke also gets split-folding rear seats that fold forward completely flat. Whilst it’s not a novel USP to have in a car like this, it does mean that – when combined with that load lip – it’s surprisingly easy to slide heavier and more cumbersome items in and out the trunk. We weren’t lying when we said the Nissan Juke’s tiny-on-paper cargo capacity is more usable than you think... Finally, the last commendable point about the Nissan Juke’s interior is regards to build quality. Most of the materials you’ll find are of a good quality for a car of this price, and some of the more questionable quality trim pieces have been masked slightly be their implantation in the cabin (the large, motorcycle fuel tank-inspired plastic mound that forms the lower center console is the most obvious example of this). Plus, the main controls are simple and easy to use on the move, with the multimedia touchscreen interface (only available on the top two of the three trim levels) being especially crisp and intuitive to operate. Our only criticism, in fact, is the tiny display near the air conditioning controls that’s fitted to all but the most basic of Juke models – not only does its size and placement make it impossible to read at a glance when driving, but the information it can display (including, but not limited to, turbocharger boost levels and a g-meter) will be irrelevant to almost all Nissan Juke buyers. The Nissan Juke also benefits from having an impressive amount of forward visibility. In spite of the jacked-up ride height, the Nissan Juke isn’t a car that lollops about in the bends. 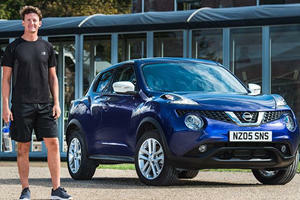 On the contrary, the Juke actually remains fairly level, with surprisingly well contained body lean through the corners for such a relatively tall car. Yet that hasn’t come at the expense of ride quality – though the firm suspension does rear its ugly head when you’re traversing rougher road surfaces or driving over highway expansion joints, the Nissan Juke remains fairly calm and composed in almost all other driving scenarios. The Nissan Juke also benefits from having an impressive amount of forward visibility, with the large windshield, bulging front fenders and the high driving position making this car quite easy to place where you want it to. Likewise, the view out back is also fairly good, and the standard-fit rear reversing camera should alleviate any grumbles caused by the thick rear posts. Fuel economy is also fairly good on the Nissan Juke. The regular Nissan Juke shares more than a platform with the Nismo variants, though – they also have highly similar, 1.6-liter turbocharged four-cylinder gasoline engines. Obviously, the Nismo models have more power, but the regular version still has a strong 188hp power output – which should be enough for the needs of most Juke buyers. It’s also the only engine option available for the regular Juke, so we’re glad to say it’s a fairly good one. That strong output, along with the broad torque band, makes getting up to speed in the Nissan Juke fairly simple – even though, at lower speeds, you can overwhelm the driven wheels on front-wheel drive models if you’re not careful enough with the gas pedal. Fuel economy is also fairly good on the Nissan Juke, with 28mpg and 32mpg in city and highway scenarios respectively. Plus, fitting the optional all-wheel drive system doesn’t hamper fuel consumption rates that much, with Nissan claiming a 1mpg and 2mpg respectively when compared with the front-wheel drive system. That said, as fitting all-wheel drive does increase the list price by $1,850, it is an option we’d hesitate on recommending unless you’ll need the added traction benefits. For obvious reasons, we’d advise you stay with as low a trim as possible on the car you’re buying. For obvious reasons, we’d advise you stay with as low a trim as possible on the car you’re buying. Piling more stuff on bumps up the price – in some cases, considerably so – and we don’t want you spending more money than you need to. In light of that, though, we reckon you should skip the entry-level Nissan Juke if you’re shopping around for one, and instead plump for the mid-range ‘SV’ trim. That’s not to say the basic ‘S’ spec doesn’t have much on offer. On the contrary, even the most basic Nissan Jukes come with alloy wheels, Bluetooth connectivity, cruise control, keyless start, tire pressure monitoring systems, a reversing camera, split-folding rear seats and a sizeable array of front, side and curtain airbags. 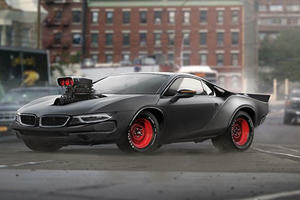 However, the extra gear that comes with the ‘SV’ spec is, we feel, worth the extra $2,000 it’ll add onto the list price. On top of the kit in the ‘S’ trim, adding ‘SV’ to your Nissan Juke bolts on a higher grade cloth seating trim, climate control, a false floor in the trunk and Nissan’s I-CON driver mode selection system that, in its ‘Sport’ setting, makes the CVT transmission even more enjoyable to use in its faux-manual setting. Add on the $1,490 Technology Package, which brings with it a really user-friendly touchscreen multimedia interface and an object detection system that warns the driver of any obstructions during low speed manoeuvres, and you’ll have yourself all the Nissan Juke you’ll ever need. The only big drawback to plumping for a Nissan Juke, in fact, is that it doesn’t hold onto its value as well as some competitors. A feature we do advise you steer clear of, however, is the optional all-wheel drive system. 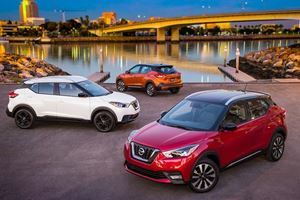 Though it’s not inherently a bad feature, we feel the traction benefits are outweighed by its cost ($1,850) and impact to fuel economy (26/31mpg for the city and highway respectively, versus the front-wheel drive Juke’s claimed 28/32mpg ratings). No matter which Nissan Juke model you do go for, you’ll end up having a reasonably priced car, albeit one that doesn’t quite have the MSRP edge it used to – a , and specified to the same level as a Nissan Juke in ‘SV’ trim retail for roughly the same amount of money. You do have the consolation, however, of knowing a $33,835 Nissan Juke loaded with every possible optional extra is only $135 more expensive than the on sale today, and nearly a grand cheaper than an (a car that doesn’t even come with a reversing camera as standard!) The only big drawback to plumping for a Nissan Juke, in fact, is that it doesn’t hold onto its value as well as some competitors. For a car that’s been in production for over five years now, the Nissan Juke remains a surprisingly competitive car. Admittedly, it is starting to lag behind its rivals in some places now (the lack of space in the rear seats is, we feel, the biggest hindrance to the car’s appeal), but the Nissan Juke does do enough to remain one of the better compact crossovers in this class. The quirky Juke has been replaced with a more conventional crossover. These wacky creations will never see the light of day. Sweat-sensing technology in the seats alert you if you need a top-up. Of water, that is, not alcohol.